Freedom, WI - December 19, 2018 - The Dirt Kings Late Model Tour is excited to announce the 2019 schedule for the DiscountShopTowels.com Dirt Kings Late Model Tour with 13 races at 9 different dirt tracks across the state of Wisconsin. 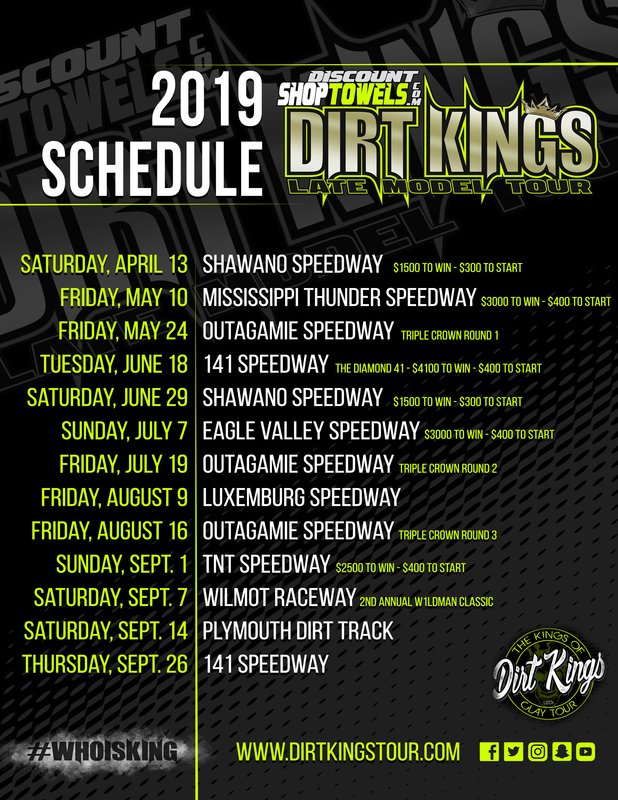 The 2019 Kings of Clay Tour begins at Shawano Speedway on Saturday, April 13, at the the legendary 1/2 mile oval track at the Shawano County Fairgrounds. The Gehm’s Club 117 Spring Thaw will be the first of two visits to Shawano Speedway in 2019. On Friday, May 10, the Dirt Kings travel to Mississippi Thunder Speedway in Fountain City, WI, for their first ever visit to the 3/8 mile high-banked oval. The Rumble by the River 40 pays $3000 to the King and $400 to start. Outagamie Speedway in Seymour, WI, hosts the first of three Dirt Kings Tour "Triple Crown" races on Friday, May 24. The Diamond 41 returns as the crown jewel of the 2019 Kings of Clay Tour on Tuesday, June 18, at 141 Speedway in Francis Creek, WI. The King takes home a check for $4100 in the 41 lap race. Next, the Tour returns to Shawano Speedway a second time for the Gehm's Club 117 Kings Classic on Saturday, June 29. The Tour swings back to western Wisconsin and visits Eagle Valley Speedway in Jim Falls, on Sunday, July 7. The Independence Day Bash pays $3000 to the King and $400 to start. Friday, July 19, marks the second race of the "Triple Crown" at Outagamie Speedway in Seymour, WI. The Tour returns to the Green Bay area on Friday, August 9, for the Battle by the Bay at Luxemburg Speedway. The third and final race of the "Triple Crown" at Outagamie Speedway in Seymour, WI, is Friday, August 16. Four action-packed events will highlight the month of September. The Dirt Kings Tour travels to TNT Speedway for the $2500-to-win Labor Day Shootout on Sunday, September 1, in Three Lakes, WI. Wilmot Raceway will host the second annual Dirt Kings Tour Jim "Wildman" Watson Classic on Saturday, September 7, at the 3/8 mile oval in Wilmot, WI. On Saturday, September 14, the Tour makes their annual visit to Plymouth Dirt Track Racing at the Sheboygan County Fairgrounds in Plymouth, WI. 141 Speedway will one again host the season finale for the DiscountShopTowels.com Dirt Kings Late Model Tour on Thursday, September 26 for the Crowning of the King. Stay tuned for additional information about the 2019 DiscountShopTowels.comDirt Kings Late Model Tour in the coming weeks. To learn more about DiscountShopTowels.com Dirt Kings Tour, be sure to follow the Dirt Kings Tour on Facebook (/dirtkingstour), on Twitter (@DirtKingsTour), on Instagram (DirtKingsTour) and Snapchat (DirtKingsTour). add username: dirtkingstour on snapchat for race day snaps and updates!